Stone Cold Records presents the ‘Strange Summer’ tour. Three of the most musically arousing summer nights in the mayan calendar. Having collectively conquered the best of the New Zealand musics underground scene, Summer Thieves and Strangely Arousing have now cemented themselves as must-sees within New Zealand’s festival circuit, with the combined experience of most major New Zealand festival on the summer calendar both bands bring you performances and production that rival that of an international headliner. In one corner of the ring, the powerhouse rock 5 piece straight out of Otago bring their unique blend of summer vibes and well known bangers which have been heard across popular NZ radio waves. 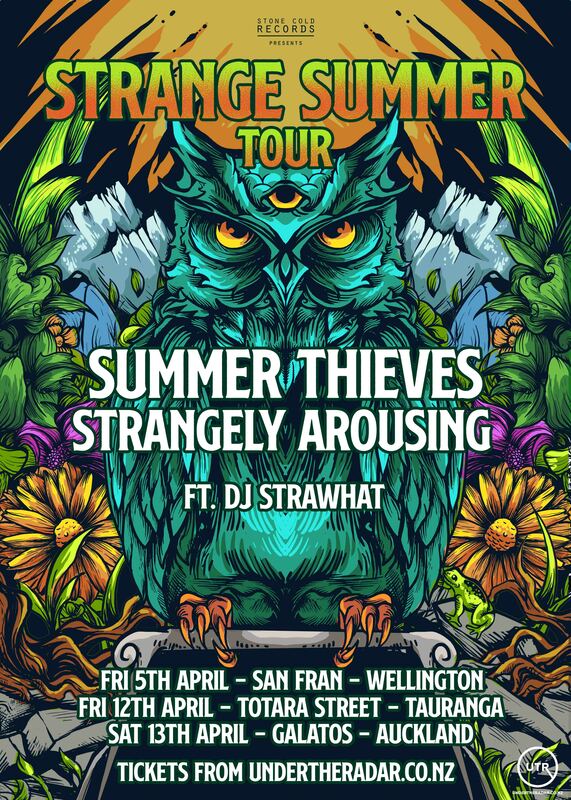 Having supported Sticky Fingers NZ tours 4 years running the Summer Thieves heavy weights bring the combined experience of supporting slots on sell out tours with Macklemore & Ryan Lewis, Hermitude, Peking Duk, & Ocean Alley as well as local heavyweights Six60, Katchafire and Sons of Zion. On the other end of the seesaw from an era where humans are no longer boxed by sexuality, one might describe Strangely Arousing as “trans genre” and comfortably so. Their reggae-based, jazz-funk collection has led them to conquer New Zealand and explore the international boundaries of Asia and Middle East. Both bands are well known for their electrifying live performances throughout New Zealand and abroad. The auckland crowd gets the absolute pleasure of Special guests "She Loves you" opening the show and heating up the evening. Inspired by late nights, wine, and a mutual love for the Arctic Monkeys this all female lineup charges with dirty rock n roll energy surely getting you in the mood to be aroused while getting warpy! The addition of DJ Straw Hat to the tour bus will ensure the crowd does not leave the dance floor. Presenting an eclectic set that features jazz, house, hip-hop, funk and bangers (sometimes all at once) before inevitably melting into into a selection of drops so fat they will certainly summon the ensuing apocalypse. Each of these acts have sold out similar venues on their own merits so you’ll need to get tickets quick to ensure you don’t miss out.